High quality at super low cost! Only 37 cents with orders of 500 or more. Deliver holiday greetings with thanks and a useful product. Keeps your message in front of customers for an entire year. Punch-out magnet gives option of a separate business card magnet. Backer card has handy 2018 calendar. FREE pre-printed envelopes for easy mailing. We have a version specifically for real estate companies (shown). Standard edition includes room to write notes. Handy! Choose cover artwork from variety of colorful options. Fast turn! Delivery in days! The good news for kids is school will soon be out for the summer. For those of us in the Promotional Products Industry, the good news planning is underway for the next school year. Now is the ideal time to help your schools — be they elementary schools, high schools, colleges or wherever education takes place — by helping them prepare for the upcoming school year. Here’s some ideas for economical products that help boost school spirit, help with fund raising and spread information about the upcoming year. Magnets — Sports schedules, mascot images for lockers and vehicles, emergency numbers, school staff contact information. Calendars — Customize a school calendar of events. Every inch of our calendars can be customized. Laminated Cards — Schedules, parking permits, signage, wallet cards with emergency numbers. Hand Fans — Perfect spirit boosters for hot fall sports events and gatherings in the auditorium. Magnetic Memo Boards — The refrigerator is the best space ever for school families to leave and receive messages. Stickers / Decals — Help sports team show their spirit on notebooks, lockers, equipment bags, car windows and more. Mailers — Brightly colored post cards an ideal way to deliver messages and schedules directly to the hands of constituents. Banners — Bright banners promote special events, help identify seating areas and show off team spirit. Notpads — What better way to welcome back students and teachers with colorful and customized notepads? Folders — Presentation folders with school colors and images let everyone carry their papers with pride. CLICK NOW and start getting ready for school! Carry-out sales with March Magnets! Help your carry-out and delivery customers make the most of the the season’s basketball tournament action. Magnetic business cards and refrigerator magnets are the perfect marketing complement to watch-party deliveries. Magnets let fans keep your contact information where they’ll see it day in and day out. Your message on the fridge will be seen when the hungries set in. FAST TURN! HURRY TO CATCH THE ACTION! TradeNet’s Magnetic Business Card Calendars are popular for good reason: they deliver! Now they deliver even better thanks to an expanded array of colorful cover presentations. It’s easier than ever to select a calendar cover that fits your message. How do they work? 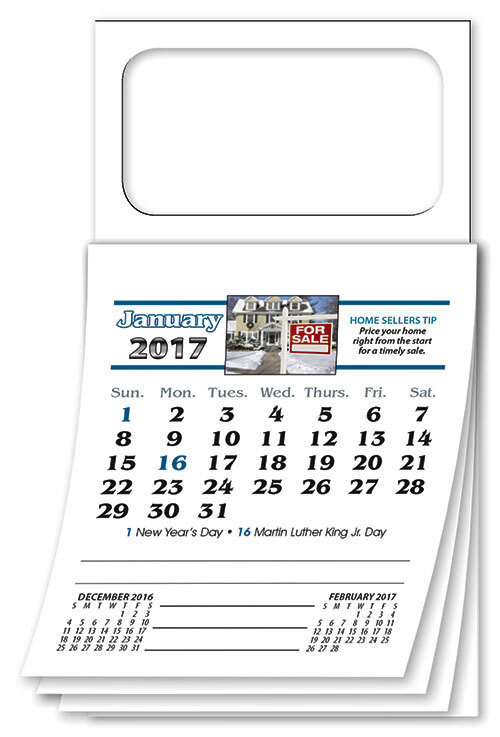 Simply peel and stick a business card to a magnet calendar backer and you have a functional product used throughout the year. These calendars are great for mailing (think statement stuffers or holiday greeting cards) and are easy to distribute. Order enough so every rep in the office can hand them out! The whole idea behind a business card it to get your contact information in front of customers, prospects and associates. For pennies, it’s possible to keep your message front and center on a daily basis. Peel-and-stick Magnetic Business Card Calendars make practical end-of-year gifts that are both appreciated and used. With your business card as a topper, your name and message get seen whether on the fridge, office file cabinet or garage workshop. TradeNet’s Peel-and-Stick Business Card Calendars go a step further. The center of the peel-off magnet topper is removable and can be used to turn any paper business card into a magnet. It lets one item be put to use twice! Shipping for January 2016 calendars begins on September 1, but now’s the time to collect orders and be ready. Order 500 or more and get 5,000-quantity pricing. 37 cents each!